The Tigris and Euphrates, with their tributaries, form a major river system in Western Asia. From sources originating in eastern Turkey, they flow by/through Syria through Iraq into the Persian Gulf. The system is part of the Palearctic Tigris–Euphrates ecoregion, which includes Iraq and parts of Turkey, Syria, Iran, Saudi Arabia, Kuwait, and Jordan. The region has historical importance as part of the Fertile Crescent region, in which civilization is believed to have first emerged. The ecoregion is characterized by two large rivers, the Tigris and Euphrates. The rivers have several small tributaries which feed into the system from shallow freshwater lakes, swamps, and marshes, all surrounded by desert. The hydrology of these vast marshes is extremely important to the ecology of the entire upper Persian Gulf. Historically, the area is known as Mesopotamia. As part of the larger Fertile Crescent, it saw the earliest emergence of literate urban civilization in the Uruk period, for which reason it is often described as a "Cradle of Civilization". The Tigris–Euphrates Basin is shared by Turkey, Syria, Iraq, Iran and Kuwait. Many Tigris tributaries originate in Iran and a Tigris–Euphrates confluence forms part of the Kuwait–Iraq border. Since the 1960s and in the 1970s, when Turkey began the GAP project in earnest, water disputes have regularly occurred in addition to the associated dam's effects on the environment. In addition, Syrian and Iranian dam construction has also contributed to political tension within the basin, particularly during drought. 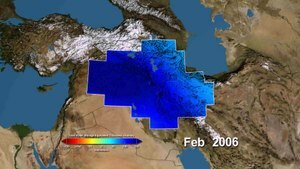 This visualization shows variations in total water storage from normal, in millimeters, in the Tigris and Euphrates river basins, from January 2003 through December 2009. Reds represent drier conditions, while blues represent wetter conditions. The effects of the seasons are evident, as is the major drought that hit the region in 2007. The majority of the water lost was due to reductions in groundwater caused by human activities. Iraq suffers from desertification and soil salination due in large part to thousands of years of agricultural activity. Water and plant life are sparse. Saddam Hussein's government water-control projects drained the inhabited marsh areas east of An Nasiriyah by drying up or diverting streams and rivers. Shi'a Muslims were displaced under the Ba'athist regime. The destruction of the natural habitat poses serious threats to the area's wildlife populations. There are also inadequate supplies of potable water. The marshlands were an extensive natural wetlands ecosystem which developed over thousands of years in the Tigris–Euphrates basin and once covered 15–20,000 square kilometers. According to the United Nations Environmental Program and the AMAR Charitable Foundation, between 84% and 90% of the marshes have been destroyed since the 1970s. In 1994, 60 percent of the wetlands were destroyed by Hussein's regime – drained to permit military access and greater political control of the native Marsh Arabs. Canals, dykes and dams were built routing the water of the Tigris and Euphrates Rivers around the marshes, instead of allowing water to move slowly through the marshland. After part of the Euphrates was dried up due to re-routing its water to the sea, a dam was built so water could not back up from the Tigris and sustain the former marshland. Some marshlands were burned and pipes buried underground helped to carry away water for quicker drying. In 2008, Turkey, Iraq and Syria agreed to restart the Joint Trilateral Committee on water for the three nations for better water resources management. Turkey, Iraq and Syria signed a memorandum of understanding on September 3, 2009, in order to strengthen communication within the Tigris–Euphrates Basin and to develop joint water-flow-monitoring stations. On September 19, 2009, Turkey formally agreed to increase the flow of the Euphrates River to 450 to 500 m³/s, but only until October 20, 2009. In exchange, Iraq agreed to trade petroleum with Turkey and help curb Kurdish militant activity in their border region. One of Turkey's last large GAP dams on the Tigris – the Ilisu Dam – is strongly opposed by Iraq and is the source of political strife. 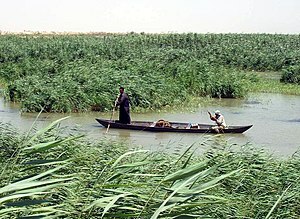 The Mesopotamian Marshes in southern Iraq were historically the largest wetland ecosystem of Western Eurasia. Their drainage began in the 1950s, to reclaim land for agriculture and oil exploration. Saddam Hussein extended this work in the late 1980s and early 1990s, as part of ecological warfare against the Marsh Arabs, a rebellious group of people in Baathist Iraq. However, with the breaching of the dikes by local communities after the 2003 invasion of Iraq and the ending of a four-year drought that same year, the process has been reversed and the marshes have experienced a substantial rate of recovery. The permanent wetlands now cover more than 50% of pre-1970s levels, with a remarkable regrowth of the Hammar and Hawizeh Marshes and some recovery of the Central Marshes. ^ Matthew Zentner (2012). Design and impact of water treaties: Managing climate change. p. 144. The Tigris-Euphrates-Shatt al Arab is shared between Iraq, Iran, Syria, Kuwait and Turkey. ^ "Lower Tigris & Euphrates". feow.org. 2013. ^ a b Deniz Bozkurt; Omer Lutfi Sen (2012). "Hydrological response of past and future climate changes in the Euphrates-Tigris Basin" (PDF). p. 1. 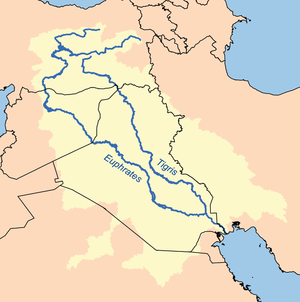 The Euphrates-Tigris Basin, covering areas in five countries (Turkey, Iraq, Syria, Iran and Kuwait), is a major water resource of the Middle East. ^ Gibson, McGuire (17 March 2014). "Tigris-Euphrates river system". Encyclopædia Britannica. Retrieved 11 May 2014. ^ "Euphrates River". Encyclopædia Britannica. 17 December 2017. Retrieved 17 December 2017. ^ Dan Caldwel (2011). Vortex of Conflict: U.S. Policy Toward Afghanistan, Pakistan, and Iraq. p. 60. Wikivoyage has a travel guide for Mesopotamia (Middle East).